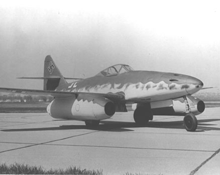 The Messerschmitt Me 262, which was the first jet fighter to fly in combat. The German military was known for deploying new technologies far in advance of the Allies. The technology strategy of the Allies was, essentially, to deploy in overwhelming numbers weapons based on the weapons technology of the 1930s, manufactured using leading-edge methods of the 1940s. The German strategy was rather different. It explicitly depended on being the first with new, more powerful weapons technologies. Although the Germans did succeed in deploying modern technologies first, they were unable to deploy these weapons in sufficient numbers. One wonders why they chose such a path. One explanation is that at some point, the technology strategy was hijacked by the military, who began pursuing advanced technology for its own sake. In his book, Why the Allies Won, Richard Overy makes precisely this point. In effect, Germany chose a technology strategy based on preference rather than results, and seems to have been unaware that preference distorted its judgment. Photo courtesy U.S. National Aeronautics and Space Administration. Although we don't always realize how our own preferences affect the outcomes of our efforts while those efforts are underway, this effect is often clearer after the fact. Obvious, too, is the effect of preferences on the outcomes of the efforts of other people. For instance, we easily understand why people procrastinate doing what they dislike. And we can also understand why people spend too much effort working on things they enjoy. Yet we repeatedly misallocate resources. We often have the feeling that "we should have started this earlier;" or "We should have spent more on that;" or "We should never have undertaken this effort at all." Is it possible that so many tasks are beyond our ability to estimate the resources required? Or is something else is going on? Something we don't recognize? Perhaps the problem relates to preferences in a subtler way. One key to understanding the hidden effects of preferences might be the very fact that we feel that we could have foreseen the outcome. When we have a feeling after the fact, that we could have recognized some condition or other, we're acknowledging that we might have overlooked something. We might have failed to acquire information that was actually available. Or we might have failed to notice a connection that is now obvious. There are many possibilities, but one that is most difficult to accept is that we might be dealing with a phenomenon that distorts our judgment. Accepting that our judgment might have been distorted can be upsetting, because we rely on judgment in almost every decision-making exercise. But rejecting out of hand the possibility of distortions makes us vulnerable to future distortions. decision-making exercisethe effect of appeal or repulsion goes beyond mere resource allocation. Using the Eisenhower Matrix, popularized by Steven Covey as the Importance/Urgency Matrix, we can see that appeal or repulsion can distort our priorities by distorting our assessment of the importance or the urgency of tasks. Simply put, we're more likely to regard as important or urgent those tasks that we find appealing, and less likely to so regard those tasks we find repellent. In Covey's terms, appeal pushes tasks toward Quadrant I (both urgent and important), while repulsion pushes tasks towards Quadrant IV (both non-urgent and unimportant). And since the effect of appeal or repulsion is a distortion of judgment, this tendency is usually outside our awareness. There is much on the Web about the Eisenhower Matrix and the Importance/Urgency Matrix. For Covey's approach, see his book, First Things First. Would you like to see your comments posted here? rbrenhjwojRYTrKeSgudgner@ChacIAuOsJQleQuSDlqwoCanyon.comSend me your comments by email, or by Web form. I offer email and telephone coaching at both corporate and individual rates. Contact Rick for details at rbrenjdbnRSYxutiTFlSMner@ChacyXTUbPgFflRRPLQdoCanyon.com or (650) 787-6475, or toll-free in the continental US at (866) 378-5470.